Basements were the original bonus rooms long before they became a popular feature in new homes. Originally designed with utility in mind, the basement was the place to do laundry, store food and tools. Basements today are versatile spaces that expand the living area of your home. The finished basement in a classic split-level home often includes a bedroom or two, a bathroom, and a family or game room, and a bath. In newer homes, a walk-out basement can also serve as a mudroom. Older homes with finished basements usually have more open space, with small ground-level windows. Each basement style has its own color needs, and a lot depends on how you plan to use your basement. A basement with several sources of natural light gives you the most flexibility in choosing a color. Dark or light colors will look great in your basement, and you'll have little worry about the colors making the room feel small or confining. A basement with ground-level windows can reflect the green of your landscaping and grass through the windows, so you'll want to consider the effect of the green reflecting on your walls during daylight hours. Sampling paint in your basement is crucial because your landscape or ground cover can change your paint color dramatically in the daylight when the windows are so close to the ground. In any other room of your home, a lack of natural light could be a problem. 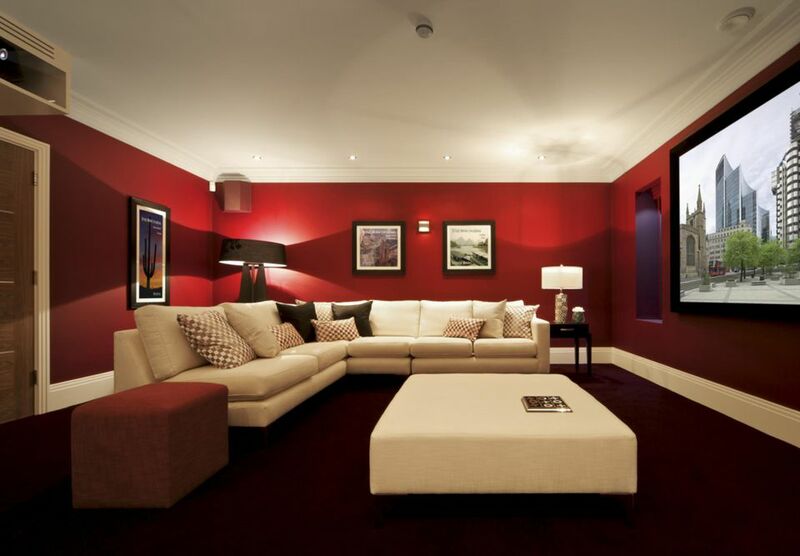 For a basement, it can mean the perfect spot for a media room or home theater. Without natural light, your lighting fixtures become even more important in choosing your wall color. Though it seems illogical, a room without much natural light can be the perfect place for deep and rich colors. The secret to avoiding a cave-like room will be adjusting your basement's lighting. Make sure that you have lighting from several sources, and that you don't have dark corners around the basement. If you're decorating the basement as a man cave, then you'll be less concerned with the space feeling cave-like, and can choose any dark color you like. Just be sure to have adequate lighting for whatever activity will be going on in there. Stone or cinderblock walls are very common in basements. If your basement has any moisture issues, you'll need to fix those problems before adding any paint to the walls, especially if you'll be covering cement or stone in the basement. If your basement features a stone fireplace or extensive cement or cinder block features, be sure to take the color of the stone or cement into account when choosing your colors. Stone and cement can cast a gray shadow onto white walls, or walls with weak colors. You'll want to choose saturated wall colors to reduce all that gray in the basement. Some basements are wide open spaces. Choosing just one paint color for the entire basement can seem overwhelming. If you're decorating a large open basement that will encompass a variety of uses, you can use color to separate divide it up into activity areas. Don't be afraid to mix the colors up from area to area to create visual separation. A media area at one end of the basement can be painted in a rich blue, while the kid's play area in the other corner can be decorated in yellow. Try using molding or stripes vertically to separate your separate spaces. Room dividers, fireplaces, and shelves can help you separate your paint colors more attractively than just starting and stopping color in the middle of a wall. Choose one color scheme for the entire basement using your main color throughout with accents in each activity area to tie everything in. You can flip your color palette from one area to the next to give the basement a coordinated look. What's Wrong With That New Paint Color?